Situated on San Antonio Bay, the complex has great views out to sea and you'll be far enough away from the hustle and bustle of San antonio Town to enjoy the peace and quiet. My husband and booked a week at this hotel and returned 28.5.11. We were really pleased when we arrived. The hotel is very clean, the staff were all very friendly and happy to help. We had a fantastic holiday and didnt want to leave. The food was very much like all the other inclusive holidays we've been on but the snacks were very good ie pizza, chips, toasted sandwiches. The hotel is about a 30 minute pleasant walk or a 10 minute mini ferry ride from all the action in San Antonio Bay but did have a good few bars, places to eat and shops of its own but they are far enough along the street that it quiet when sleeping at nights. The entertainment was good. Bingo every night with cash prizes and also shows etc. I would definately consider go again. The apartments look really nice from the outside and really posh and when you first go in they look posh. The bathroom in the apartments is really big, it has lots of room, but the rest of the apartment is small. The kitchen is very small and there is no room to cook. If you look out from the balconys you can see building work which is not finished and has been there for 7 years, but you can see the pool aswell which is nice. The staff at the bar are really nice and friendly, the pool is big and there are lots of sunbeds to sunbathe on. The maids are not very nice though. There is a game room and pool table and you can go on the computer. There are sometimes singers at night which is good but when there are no singers it is not very good but you can go out at night and ther are lots of places to go which is really good. Just back from a 2 week holiday in Ibiza, stayed at the Rosamar. 1st impressions, hotel was lovely, staff really friendly, very clean, room was a good size. I can't fault the hotel itself, but Thomsons really have to decide if this hotel is for families or youngsters. I have a 2 year old daughter who's inflatable dolphin was burst by yobs jumping all over it, 2 of her beachballs went missing and the language from them was disgusting. We were woke up through the night with people coming in from the clubs singing, shouting, running along the corridors, moving furniture and even setting the fire alarm off. Not exactly the relaxing family holiday we were planning. Don't think i'll be booking with thomsons again. We have not long come back from ibiza , we booked for the 20th september for all the closing parties. We wanted a 4* apposed to a basic hotel . teh location is spot on 2 minutes from restraunts and bars on the bay.The location is also good as if you want a bit of peace and quiet but want it liveler when you want it take a short boat ride to the town. The staff at the Rosamar are lovely there ready to help , the food is lush . We had a two inter connecting rooms which was brill as there was two girls and a boy so we had two rooms with a double bed and two singles with two bathrooms!!! wicked . I loved everything about the Rosamar we are booking for next year can't wait!!!!!!!! One of the worst family holidays ever! Firstly I will say that the hotel was very clean and our room was cleaned very well most days. The weather was fabulous too. The only problem was that the hotel is part Freestyle (Thomson's name for 18-30 holiday makers) - and is supposed to be a family hotel too. We had reservations before going after reading reviews regarding this fact on websites (including this one) - we even went into the Thomson shop we booked our holiday at and told them we were concerned - we were informed by them that the hotel is 2 seperate blocks - 1 for families and 1 for Freestyle holidaymakers - and only in very high season (July and August) would there be a chance the two could be integrated. Well we were unlucky then! As we got put between 4 rooms of very noisy 18-30 holiday makers who came in every morning at 4am and partied in their rooms until 6am or later...! I had broken sleep for 7 nights and was pleased to come home - my 2 year old daughter woke up screaming from the noise coming from the room next door - shouting, swearing etc. We did see our Rep on about the fourth day - she told us it was really unforunate we had been integrated in the same block as the 18-30's as this doesn't normally happen in June - clubbers etc usually go out to Ibiza in July/August. She said she would give us a complaints form to fill out - we declined - what use would it do - they never do anything about it anyway! Hotel Entertainment?! We stayed in the hotel one evening - as there was supposed to be a mini disco at 8:30pm - there was only two kids there - which were our 2 kids so the entertainment(!?) guy did the disco for our two - which was good of him - then the parrot show was supposed to start at 9pm - but the people doing it turned up and said there was not enough people there to watch it so they would come back later - guess what time they came back - 11:30pm!! Another thing - we were on the 2nd floor with a pool view - some inconsiderate moron's above us on the 3rd floor thought it funny to flick their cigarette ash down onto our balcony - covering our towels and swimwear as they were out there drying - not funny, not clever! If you are going to the Rosamar - good luck if you have a small family! 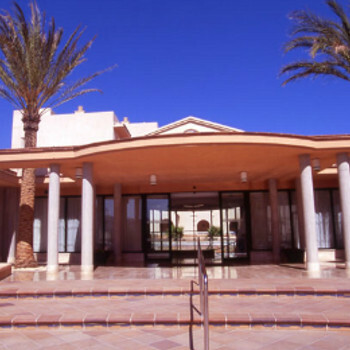 It was the first time I have been to Ibiza, so the fist time I have stayed at the Rosamar hotel. I think this was an excellent hotel to stay in. The rooms were very clean and the bar and reception staff were always friendly. I will be staying at the aparthotel Rosamar again next year! Our group consisted of 6 women and 2 infants, we were hoping for a clean, safe a fairly peaceful hotel and were not disappointed. The Rosamar was clean and very well presented, arriving you do feel that you are entering a a 5 star lobby. The rooms are more than big enough and cleaned every day or two, and fresh towells and sheets supplied. The bathroom was big enough for 4 girls to share....enough said. The huge bonus if you are lucky enough to get a room on the ground floor over looking the pool, is the size of the balcony...its huge! The pool area is beautiful especially in the evening. Juan and the rest of the guys on the bar really look after you, and despite long shifts catering to the needs of brits abroad they were always smiling. Its location is fine, the beach, shops and bars are only 10 minutes away, and only about 4 euros in a taxi to the West End. We had a fantastic 2 week break at the Rosamar and would highly recommend it to all.